Qatar is well on the way to becoming one of the world’s leading producers of chemical fertilisers, steadily developing new capacity and new markets as it works to diversify its economy away from its primary dependence on energy sales. However, rising production levels across the Gulf region and an increasingly competitive global market may limit returns in the medium term. Currently, oil and natural gas production accounts for around 60 per cent of Qatar’s gross domestic product (GDP) and up to 85 per cent of its export earnings according to the Organisation of the Petroleum Exporting Countries (Opec). This revenue may well come under pressure in the coming years as shale gas production in the US and conventional gas output in Australia is ramped up. Doha has long recognised the need to diversify away from dependency on a single product to underpin its economy, and has been investing extensively in downstream petrochemical industries. One of the centrepieces in this programme is the production of a range of fertilisers, with the industry based around the Qatar Fertiliser Company (Qafco). Since beginning production in 1973, Qafco has expanded to become one of the world’s biggest fertiliser producers, and is now the world’s largest exporter of urea with a 15 per cent market share, shipping to 45 countries. According to data from the Gulf Petrochemicals and Chemicals Association (GPCA), Qatar accounts for around 35 per cent of all fertiliser production in the Gulf Co-operation Council (GCC) bloc. This figure is set to rise sharply by the end of the decade as the emirate brings more capacity on line through the expansion of existing facilities and the opening of new plants. 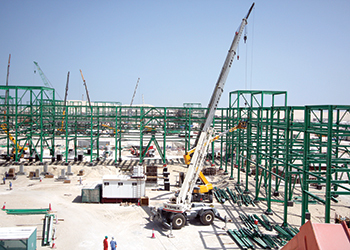 The GPCA has estimated Qatar’s fertiliser output will reach 29.5 million tonnes – 13 million tonnes of ammonia and 16.5 million tonnes of urea – by 2020, more than double the country’s present production levels. This rate of increase is likely to outstrip that of production rises across the rest of the region, with the GPCA forecasting installed capacity to increase by 47 per cent from 2012 levels to reach 46.6 million tonnes by 2018 across the GCC bloc. This growth, fuelled by $10 billion or more worth of new developments, would produce 10 per cent year-on-year production expansion. While Qatar will be leading the way with capacity expansion, the anticipated pace of growth may not be matched by global demand. The GPCA has projected that global fertiliser demand will rise by a more modest 1.8 per cent a year through to 2018 – just one of a number of factors that will make the operational environment more difficult in the coming years as it works to lock in new sales. Saudi Arabia will present strong competition to Qatar’s expansion in the international market. Already the region’s largest producer of chemical fertilisers, the kingdom has decided to scale back on its own agricultural production, such as halting wheat production by 2016. This could free up more locally produced fertilisers for export. Despite this potential rivalry, Qafco Chairman Abdulaziz bin Ahmed Al Malki says Qatar can carve out an increasingly large niche in the international market. "The global demand is currently such that there is room for all the current players to supply the market," he told OBG. "Qafco has to ensure that the quality and production of our products are excellent and there will always be a place for them." Qatar recently has been stepping up exports to some rapidly expanding markets such as Brazil. But shifting trends in the global market may put further pressure on sales. One of the world’s largest buyers of fertilisers, India, has been looking to reduce imports with suggestions the new government of Prime Minister Narendra Modi will push to promote domestic fertiliser production as a way to boost employment and cut the national import bill. This, combined with calls to raise prices of urea and other petrochemical-based fertilisers to encourage greater use of phosphates and potash, could see a shrinking of demand from the world’s second most populous country and a potential narrowing of the market space. Long-term prospects remain strong, however, with the world’s population set to top over 9 billion by 2050, according to the United Nations, meaning that the demand for food, and thus fertilisers, will keep on increasing.